Rudy Giuliani and his wife Judith in 2016. Former Mayor Rudy Giuliani spent nearly $900,000 since April, including around $12,000 on cigars and $7,100 on pens, his wife claimed at a divorce proceeding. Judith Giuliani and her husband of 15 years appeared in court Wednesday in New York City in the wake of their divorce filings. 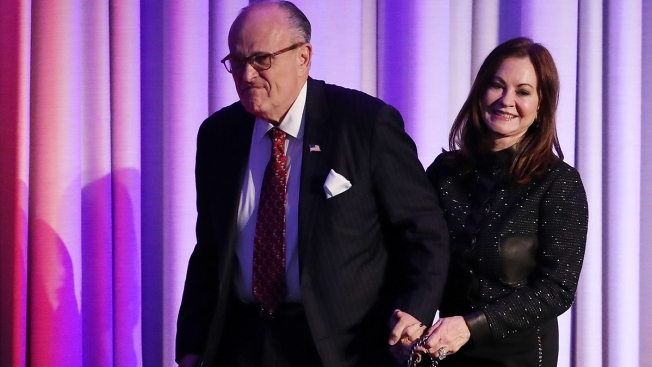 Court papers claim Rudy Giuliani, 74, spent nearly $900,000 since April, including $286,532 to support his alleged mistress, Maria Rosa Ryan, $447,938 “for his own enjoyment” and $165,165 for travel expenses. His wife’s counsel, meanwhile, claimed her husband spent $12,012 on cigars and $7,131 on pens since April, while simultaneously cutting her off from their credit cards. In response to his wife’s claims, Giuliani claimed he was dealing with a diminished income. “In these divorce situations, you cannot place blame, it is 50/50, there are problems on both sides, Giuliani told the Post back in April. Toward the end of their court appearance, Judge Michael Katz urged the two to work through their issues privately with their lawyers before seeking third-party discovery. “It is beyond me why this is done publicly… throwing out all [your] dirty laundry for consumption,” Judge Katz said. The two married in 2003 in what was the third marriage for both of them. Giuliani was mayor of New York from 1994 to 2001.